An interesting two-part documentary series on the BBC this evening, Traders: Millions by the Minute. The series shows us pit, hedge fund, electronic and algo traders at work in Chicago, New York, London and Amsterdam. 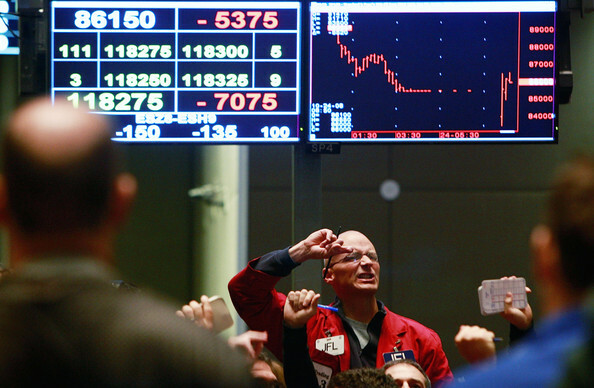 Chicago's CBOT is still the scene of pit traders in the grain commodity markets. Although many exchanges throughout the world have gone electronic there is still some liquidity in certain commodities for face-to-face trading. However, most trading is now done electronically, either by humans at a screen or algorithmically without human intervention. In London we see Amplify Trading, an electronic trading firm, training newcomers with mixed success. I am sure you will notice yourself amongst the trainees, some of whom are scared to trade and others trade too much. A few pass and are given jobs at Amplify or trade on their own accounts. The hedge fund trader in New York was less interesting, as we mostly see her family and philanthropic life rather than her work. The high-frequency trading in Amsterdam could have been more interesting but a computer trading at the micro-second level probably doesn't make for good television. All-in-all a fascinating view of people in the world of trading and maybe inspiring to sports traders too. Part two is next week and will concentrate on day traders working from home, which will probably be of more interest to sports traders. For my readers in the UK I provide a link below to the BBC iPlayer where the series will soon be available to view. In good time I am sure the series will find its way to YouTube and shhhh... BitTorrent, as does everything, eventually.